We offer all phases of asphalt repair from simple pot hole repairs to full depth asphalt repair and base remediation. 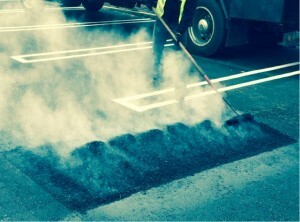 In addition, we offer infrared asphalt restoration which allows our asphalt crews to work in almost any temperatures. If repaving your entire lot is not in the current budget, our asphalt repair options serve as an excellent way to make sure your parking lot is safe and adequate without the expense of complete repaving. This will prevent lawsuits and tripping hazards in the parking lot.